•Keep farm in a dark place or all day shade if outside. •Add bedding (shredded newspaper/cardboard) to eliminate smell, and soak up moisture and prevent mold and fungus. 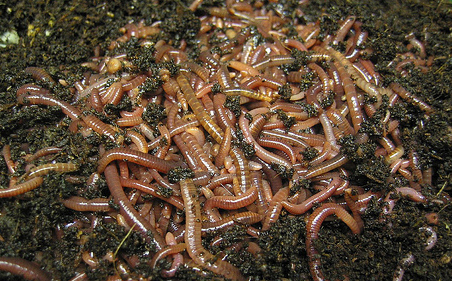 •Keep worms moist 60%-80% (food scraps will usually provide enough moisture). •Every few months, harvest the castings for plants and excess worms to start a new bin for yourself or a friend. •Happy worms will churn through waste and be prolific breeders. Eggs sacs, juveniles, and mature adults will be present. •Feed worms eggshells, cardboard, paper, fruit and vegetable scraps, coffee grounds, yard clippings, aged cow, chicken, rabbit, or horse manure. •Avoid feeding worms dairy, meat, grease, dog or cat feces. I have found that giving worms any kind of meat makes a rather bad smell. Have you had any problems like this? Yes, I would avoid meat and dairy. Stick to fruit/ veg wastes, paper products, coffee grounds, egg shells, yard clippings, and aged herbivore manure.